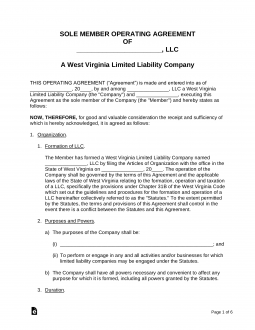 The West Virginia single-member LLC operating agreement form is a legal document that would be implemented by a sole proprietor for the purpose of properly establishing the policies of their company. This state does not require any business to file this document with the state, however, without the placement of the document the owner may find that they are personally liable, with regard to their personal assets and financial accounts, if in fact, they are presented with any type of litigation due to business failure of any kind. By completing and filing this document, the owner’s assets will remain protected. The owner should consider a thorough review of this document. Should they find that they aren’t clear with regard to the language, they may choose to work with a knowledgeable attorney for assistance in the proper completion and filing of the document.